On 12 July 2017, a Maladzečna District court tried two teachers for the death of 13-year old high school student Viktoryja Papčenia. Viktoryja died tragically last September under the wheels of a truck while harvesting potatoes for a local agricultural enterprise. School No. 11 had sent Viktoryja and her classmates to work in the field without parental consent. The practise of sending students to state agricultural enterprises to work for free during harvest time has its roots in Soviet times. This phenomenon still remains common in modern Belarus, and most Belarusians do not see it as a form of forced labour. 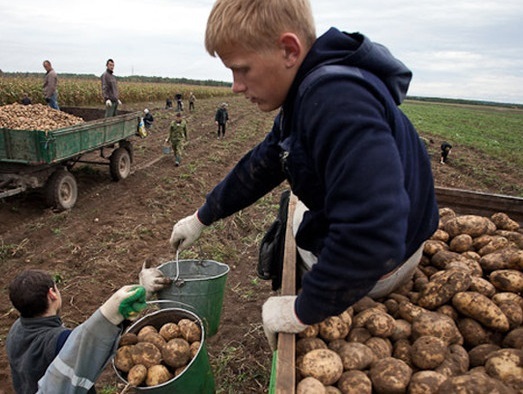 According to the International Labour Organisation, violations of workers’ rights in Belarus go beyond unpaid youth labour. The most notorious examples include forced labour of prisoners, soldiers, and inmates at labour therapy facilities, as well as occasional unpaid work on Saturdays and mandatory job placements for university graduates. In the Papčenia case, the court found the truck driver and the two supervising teachers guilty of manslaughter. However, the officials directly responsible for sending the underage students to do heavy physical work instead of going to class still walk free and keep their jobs. The chain of responsibility starts with the head of the Maladzečna District Executive Committee, Aliaksandr Jahnaviec, who organised assistance for the potato harvest. The Local Department of Education and the deputy head teacher of school No. 11, Dzianis Kurec, followed suit and ordered underage students to skip class to harvest potatoes. Finally, the teachers, who taught physics and French and were not qualified for agricultural work, agreed to supervise the students. Thus, authorities had sanctioned illegal work for minors, without even bothering to ask parents’ permission or provide work contracts. Since 1999, presidential decrees have significantly weakened workers’ rights in Belarus. For instance, Decree No. 29, signed in 1999, transformed permanent work contracts into fixed short-term contracts, endangering job security for over 90 per cent of employees. In 2014, Decree No. 5 further undermined workers’ rights, giving employers more powers to fire workers. Discriminatory labour legislation and continuous suppression of independent trade unions leave workers at the mercy of their employers. According to the International Trade Union Confederation (ITUC) Global Rights Index, Belarus ranks 5 (the lowest possible mark: ‘no guarantee of rights’) on a scale from 1 to 5, based on the degree of respect for workers’ rights. The continued existence of subotniki – another Soviet legacy of unpaid quasi-voluntary work on selected Saturdays of the year – is another symptom of this problem. Some workers have the option of staying at their workplace and contributing some part of their daily earnings to fund various public projects. Those less lucky have to perform menial tasks such as cleaning streets. By law, participation in subotniki is voluntary. In practise, however, workers have no choice, as the discriminatory fixed-term contract system severely restricts their rights and impacts job security. Should an employee refuse, the employer could decline to extend his or her contract for the next year. The teachers in the Papčenia case did not deny their guilt, but to a certain degree they were also victimised by the existing system, in which contradicting the boss could mean getting fired. A right or an obligation? According to the Belarusian Helsinki Committee, forced labour practises affect various social groups, including soldiers, inmates of detention facilities, labour therapy centres, and even recent university graduates. In 2011, former presidential candidate and then political prisoner Mikola Statkievič broke several ribs and his hand while working at a prison-run sawmill, due to lack of protective clothing. According to the human rights organisation Viasna, no charges were brought against those in charge of the correctional facility. Along with Turkmenistan, Belarus remains the only post-Soviet state to preserve labour therapy centres, commonly known as LTPs. Originally designed to re-socialise alcoholics and drug addicts, this kind of occupational rehabilitation is voluntary. However, if a person has committed over three civil offences under the influence of alcohol or narcotics, the authorities can easily commit him or her to such centres. Other groups at risk of forced labour are individuals who have lost their parental rights. According to Decree No. 18, they must reimburse the custody costs of their underage children to state childcare facilities. Should they neglect their duties due to intoxication, the authorities can place them in LTPs. LTPs remain under the jurisdiction of the Ministry of Internal Affairs, which limits access to the facilities of the public and journalists. Since 2003, the number of LTPs in Belarus has grown from two to nine. Human rights activists at Viasna estimate that the overall number of inmates exceeds 6,000. Even recent university graduates can fall victim to a form of forced labour. Although the law guarantees free higher education, scholarship holders must submit to mandatory job placement after graduation. 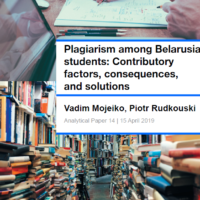 The Belarusian authorities are reluctant to abandon this programme, even though it has proven ineffective. The Belarusian Constitution guarantees every citizen the right to work in safe and secure conditions. Nevertheless, it appears that for many in modern Belarus, the right to work is more of an obligation. As the recent ‘social parasite’ protests have demonstrated, continuous implementation of Soviet inspired labour practises can result in unpredictable consequences for the regime, mobilising the protest potential in society. In Belarus, military parades usually take place twice a year: on 9 May, or Victory Day, when post-Soviet countries celebrate victory in the Great Patriotic War with Nazi Germany, and on 3 July, the official Independence Day. Thousands of members of the armed forces gather to exhibit the country's military equipment. Tanks, soldiers, and the military orchestra have become prominent symbols of the parade. Top-level officials, including president Alexander Lukashenka, also participate in the parades. Every year, the parades involve helicopters, planes, missile systems, demonstration of tanks and military vehicles, and marches accompanied by the military orchestra. Additionally, in 2011-2016, Belarus invited Russian paratroopers to join. Military parades usually involve mobilising a spectators. Organisations such as BRSM and other pro-governmental associations forcefully ensure that their members attend. Many ordinary citizens also come to the parades to look at the military equipment and large fireworks displays. The Independence Day parade, which is accompanied by patriotic songs and slogans, highlights Belarus's Soviet past. This emphasis on the Great Patriotic War, which started when Nazi Germany invaded the USSR in 1941, to a large degree overshadows Belarus's independence. The precision and scope of the parades, which is achieved at a very high cost and involves numerous rehearsals, make the phenomenon look like a scene from a movie. This year, on 3 July, more than 6,000 soldiers, hundreds of units of military equipment, and thousands of spectators took part. Logistical hassles aside, which involve diverting traffic, changing public transport schedules, and damaging roads with tank tracks, many Belarusians disagree with the very nature of the parades. The link between the official Independence Day and the parade on 3 July itself remains dubious. On 3 July, Minsk was indeed liberated from the Nazis, but the rest of Belarus remained under occupation. Earlier, Independence Day was celebrated on July 27, when Belarus became a sovereign state. Even before the military parade took place, many Belarusians were heatedly discussing it. On 24 June, during a rehearsal, a large tank bumped into a lamppost and a tree. Nobody suffered from the incident, but it garnered much attention. Belarusians then started a petition to move the parade outside Minsk. The parade is intended to demonstrate not only Belarus's military might, but also the successes of the Belarusian economic model. Therefore, along with tanks, guns, and other military equipment, the parade exhibited some of the country's non-military products. The event's organisers decided to showcase Belarusian furniture brands (Pinskdrev and Maladzechna Mebel), tractors, and even Belarusian toilets. This decision was supposed to prove that Belarus is able to produce everything it needs – from toilets to military equipment. In turn, this was intended to encourage Belarusians to buy Belarusian products. However, the presence of the toilets caused wide-spread ridicule among Belarusians on the Internet. Thus, in May, Lukashenka stated: ‘There is no need to be stingy with this [parade], especially because they are not so expensive. It should be a real parade, an impressive one. This is why it is being done. This is a demonstration, we show people that we are eating the bread of war for a reason’. According to Lukashenka's demands, the parade was indeed massive and expensive. The Ministry of Defence, however, refused to divulge its expenditures. In contrast, Russia reported the costs of its parades, despite the closed nature of its military entities. Although ascertaining the real cost Belarus's military parades remains difficult, analysts have attempted to estimate the budget of this demonstration of power. Thus, Naviny.by reports that Belarusians probably paid around $2.37m in taxes for transportation of equipment and soldiers, decorations, and fuel for tanks. Speaking with TUT.by, Belarus's most popular news portal, analyst Andrei Alesin concluded that the parade in 2009 cost $50m. However, in 2009 the parade featured 4,000 soldiers – 2,000 less than in 2017. Moreover, in 2009 there were only about 200 units of military equipment, while in 2017 there were over 500. However, given the differences between these two figures and the lack of access to concrete figures about the parades, it remains impossible to estimate the parades' true cost. Historically, the aim of military parades has been to demonstrate the country's ability to protect itself during war. After the Ukrainian conflict, which led to worries of a possible Russian intervention in Belarus, military parades possibly even reassured citizens. What's more, many believe that showing off military equipment is proof that the country has the resources to resist aggression from any side. Thus, the parade creates an illusion of military capability. The military parade of 3 July is also proof that the Belarusian government continues to demonstrate its support for Soviet traditions and symbols and sees them as a key element to nation building. These parades also involve different forms of entertainment, such as fireworks, concerts, and competitions. As Leanid Spatakaj, an analyst at Belarus Security Blog, told Belsat: ‘People need not only bread but also a spectacle: if there was no demand there would be no offer’. The Ministry of Defence is unlikely to announce the true cost of these parades in the near future. However, given the amount of military equipment, city decorations, and entertainment, this sum is nothing to sneeze at. Instead of conducting expensive military parades, Belarus could focus on updating equipment and repairing army facilities.